It’s back for another great run . . . 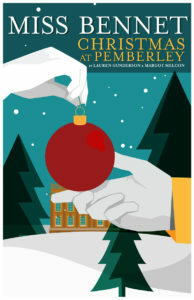 This seasonal work by award-winning Lauren Gunderson and Margot Melcon takes you back to Pemberley, some years after Pride and Prejudice. The Bennet girls had pretty much found their lives, except for Mary (Amelia Fischer) who finds solace in books and playing piano. She says she is happy; but maybe things could get better. And the story goes forward ala Moliere with one door opening as the other closes. The Darcy home of Elizabeth (Jasmine Thomas) and Fitzwilliam (Justin Walker) is the site of this Christmas fiasco. It seems their visitors hadn’t seen a tree growing in a living room before. Jane (Jeanette Illidge) and Charles Bingley (Juan Carlos Unzueta) try to stay out of the line of fire, as Lydia (Devon Hales) and Mary, and Anne (Stephanie Friedman) try to find out who may wind up hooking up with that chap down from Oxford, Arthur de Bourgh (Jonathon Horne). Since this is a work of intrigue, and directed by Carolyn Cook, I shall not tell you how things get resolved; but can tell you that all comes right as Christmas begins. The cast is in great costumes on a set designed by Seamus M. Bourne. I can say that as Act I progresses you may be asking yourself where this group is going. But, hold on; as in Act II you make your decisions and wait to find out if you may guessed correctly, for back around 1815 things weren’t always as they first seemed at the Pemberley Estate.